Review of Robert A. Ventresca, Soldier of Christ: The Life of Pope Pius XII (Cambridge, MA: Harvard University Press, 2013), 405 pp. ISBN: 978-0-674-04961-1. In Soldier of Christ: The Life of Pope Pius XII, Robert Ventresca, associate professor of history at King’s University College at the University of Western Ontario, offers us an immensely readable and authoritative biography of the elusive Eugenio Pacelli. In many ways, it surpasses all previous biographies in its comprehensive and convincing analysis of its central subject, Pope Pius XII. Ventresca adeptly bores through the polemical and problematic arguments that encompass the decades long “Pius Wars” and offers us a balanced portrait of Pacelli, who is neither a condemned reprobate nor an exalted saint. Rather, Ventresca shows that Pacelli was a man of his time, burdened with nearly insurmountable challenges, who nevertheless consistently preferred to address them through a diplomatic path of prudence and caution that always placed the needs of the institutional Church before all other concerns. Born into the “black nobility” of Roman society, Pacelli lived a privileged life that even included a rare dispensation that enabled him to avoid the rigors of seminary life for the flexibility of home with his family. Pacelli was also not ordained with his classmates, but during a separate Mass in a private chapel. Despite such an uncommon priestly formation, Ventresca concludes that amid the changes “brought about by the fall of papal Rome in 1870, it is difficult to say whether there was anything typical about Pacelli’s clerical training in the closing decades of the nineteenth century” (p. 36). Yet, Ventresca reveals that Pacelli was exceptional. Even prior to earning a doctorate in canon law in 1904, Pacelli caught the attention of Pietro Gasparri, the secretary of the Sacred Congregation for Extraordinary Ecclesiastical Affairs, who soon became a patron and ensured a smooth transition for the young priest into Vatican bureaucracy. By 1914, the talented Pacelli had replaced Gasparri when the latter rose to become secretary of state. Three years later, Pacelli himself rose in the ranks to become papal nuncio to Bavaria. Prior to his departure for Germany, Pacelli was consecrated archbishop of Sardis by Pope Benedict XV himself. For Ventresca, Pacelli’s time in Munich significantly shaped the future pontiff. It was here that Pacelli developed friendships with influential individuals, including the German Jesuit Robert Leiber, a trusted confidant, Monsignor Ludwig Kaas, the Center Party politician and future chairman, and Michael von Faulhaber (Cardinal in 1921), the archbishop of Munich and Freising. As nuncio, Pacelli was uncommonly popular in Germany, even among non-Catholics, a point noted by the German Jesuit and future Nazi resister, Father Friedrich Muckermann. Yet, this popularity had a shadow side for it enabled Pacelli to be ingratiated into Munich’s conservative circles whose “cultural biases” betrayed an antisemitic outlook that resulted, for example, in lumping together Bolsheviks and Jews. Still Ventresca minimizes the long-standing effects of such influences and does not view them as pivotal forces guiding Pacelli’s choices or actions. However, he does find Pacelli’s time in Germany to be determinate and influential to his world view. As Aloysius Muench, the bishop of Fargo, North Dakota, and post-war apostolic nuncio to Germany, noted in a comment that he had heard, Pope Pius XII “thinks that he is still nuncio in Germany” (p. 241). Ventresca’s writing, at times, might seem to be placating the various combatants of the Pius War. For example, he emphasizes Pacelli’s positive experiences of Jews, such as his friendship with Guido Mendes, whom he later aided to leave Italy for Switzerland – a point often emphasized by those authors who advocate Pacelli’s canonization. Similarly, Ventresca relates how Pacelli refused to offer a public rebuke to Cardinal George Mundelein, archbishop of Chicago, for calling Hitler “an alien, an Austrian paper-hanger, and a poor one at that” (p. 122). Yet, Ventresca also addresses the antisemitic culture of Munich (without labeling it such) and its influence on Pacelli during his time there as apostolic nuncio. He points out, for example, how Pacelli had on a few occasions spoken positively about Mussolini and his government and even gave permission for a blessing of a Fascist banner. For Ventresca, all of these factors helped shape and influence Pacelli, but none proved the single determinant for the choices he later made as pontiff. Ultimately, Ventresca negotiates the Pius War terrain without falling into the gullies of either side. Ventresca convincingly shows that Pacelli was never Hitler’s Pope. He credits Pacelli, as Vatican secretary of state, for including in the 1937 Mit Brennender Sorge encyclical the essentially critical statement: “Whoever exalts race, or the people, or the State, or a particular form of State, or the depositories of power, or any other fundamental value of the human community … whoever raises these notions above their standard value and divinizes them to an idolatrous level, distorts and perverts an order of the world planned and created by God; he is far from the true faith in God and from the concept of life which that faith upholds” (pp. 114-115). Despite standing behind such a declaration, Pacelli never specifically mentioned “Jews” in any of his statements nor did he specifically address their plight under National Socialism. For example, after receiving a report on Kristallnacht from apostolic nuncio Cesare Orsenigo, neither Pius XI nor Pacelli as secretary of state issued a response, even when pressed to do so by Cardinal Arthur Hinsley, the archbishop of Westminister. The only comment was indirect and followed a few weeks later during a speech to commemorate the two-hundred anniversary of the canonization of Saint Vincent de Paul. Ventresca writes: “Pacelli evoked the imagery of the children of Israel forced into exile, and likened the spiritual travails of the great Catholic saint to the ‘anguished lamentations’ of the Jewish people in exile in Babylon. It was a moving tribute, no doubt, to the great saint and to biblical Israel. As a spiritual exercise, it had much to recommend it. But it was a decidedly tepid political response to the escalating excesses of the Hitler state” (p. 128). Despite such a “tepid” response, Pacelli was not the desired choice of the German government to succeed Pius XI upon the latter’s death in February 1939. Nor was Pacelli the choice of Vatican insiders. Ventresca shows that there were differing views of Pacelli among Catholics and non-Catholics alike. Upon assuming the chair of Peter, Pacelli made his view of the papacy quite clear in his first formal address to the Sacred College of Cardinals on June 2, 1939: to work for peace and to use all of the Church’s resources for this effort. To this end, Pacelli worked tirelessly behind the scenes for peace. However, Ventresca reveals that Pacelli was cautiously reluctant to show the same zeal in his public pronouncements as in his private so as not to appear to be taking a particular side. He showed the same restraint whether entreated to discuss the persecution and murder of Jews or to address the subjugation of Poland and its largely Catholic population. Ventresca believes that Pope Pius XII had the courageous wherewithal to speak when warranted. As evidence, he offers the statement from the encyclical Summi Pontificatus of October 20, 1939: “The blood of countless human beings, even non-combatants raises a piteous dirge over a nation such as Our dear Poland, which, for its fidelity to the Church, for its services in the defense of Christian civilization … has a right to the generous and brotherly sympathy of the world, while it awaits … the hour of resurrection in harmony with the principles of justice and true peace” (pp. 154-155). Yet, as Ventresca shows, there were few situations where Pius XII would speak so clearly. Instead, as in the case of the German invasion of Belgium, Luxembourg, and Holland, he never issued an explicit condemnation, but only a statement of “paternal affection” (p. 160). 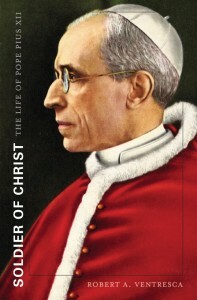 When writing to Cardinal Faulhaber of Munich, Pius XII explained his stance: “For Us impartiality means judging things according to truth and justice .… But when it comes to Our public statements, We have closely considered the situation of the church in the various countries to spare the Catholics living there from unnecessary difficulties” (p. 165). Perhaps such a statement offers an insight into why Pius XII did not say more. Ventresca clearly reveals how well informed Pius XII was about the persecution and murder of Jews throughout Europe. By mid-1942, the Holy See had received numerous reports from reliable sources about the systematic nature of the murder of Jews. Yet, Ventresca believes Pius XII to be a “man of his time, which is to say a man of limited vision with a correspondingly limited ability to perceive the precise nature of the Nazi war against the Jews” (p. 176). He also does not discount the role that antisemitism played in helping foster such a disengagement from pursuing a fuller understanding of the Jewish plight. However, Ventresca does not dwell on this point. Instead, Ventresca holds that, “the pope was not silent during the war. Nor was he oblivious to the complaints that the Holy See was not doing enough or, rather, not saying enough to condemn Nazi actions” (p. 170). Still Ventresca recognizes that the accusation of silence continues to exist and haunt the reputation of Pius XII. What is interesting is that Ventresca shows that this accusation did not begin with the Soviet Union’s campaign to dishonor Pius XII’s reputation or with the publication of Rolf Hochhuth’s play The Deputy, but that it actually goes back to beginning of Pius XII’s pontificate through the criticisms of numerous diplomats and political leaders. For Pius XII, this was not an unheard criticism. Nevertheless, the pope primarily left it to his bishops and priests locally to decide if a protest was prudent and in the best interests of everyone involved. Ventresca also alludes to the fact that Pius XII was often too reliant on the advice of individual German bishops such as Cardinal Faulhaber, who, in turn, were too immersed in the war to offer advice overly critical of Germany. Ventresca might have placed greater emphasis on the interplay between Pope Pius XII and Conrad von Preysing, the bishop of Berlin, who advocated a more adversarial path for both the Holy See and his fellow German bishops. Ultimately, it seems that Pope Pius XII never grasped “the true nature and scale of the Nazi war against the Jews and its consequences” (p. 219). Even when he did and became involved behind the scenes, such as in Slovakia and Hungary, the results showed that the Holy See’s influence could only go so far. Yet, even after the war, Pius still made no specific mention of the murder of Jews in his public comments. Ventresca reveals that Vatican officials even questioned the figures that Jewish leaders made known to them of the number of Jewish children who had perished in the Holocaust. Ventresca’s last two chapters that cover the post-war years are his least compelling, though they still contain a great deal of information and analysis. Perhaps my comment concerning “least compelling” is dictated by my own area of research, but perhaps also equally by the dearth of available archival sources of that period. If Pius XII’s voice was seldom heard during the war years, it certainly was uttered in the post-war years. The pope issued statements on a plethora of issues pertaining to theology, politics, and morality. As Ventresca states, “Pius XII wanted not so much to come to terms with the modern world as to transform it, to sanctify and ready it for its redemption” (p. 305). Pius XII attempted to live his life as an example of such public redemption. Pope Benedict XV recognized this fact and declared him to be a servant of God whose life exhibited heroic virtues. Robert Ventresca adds “Benedict’s point, simply, is to say that Eugenio Pacelli lived as a virtuous man striving in extraordinary ways to be like God. The extent to which he succeeded awaits final judgment” (p. 312). In an extremely balanced way, Ventresca’s biography reveals the virtuous life of Pius XII, but also exposes the reader to view the choices Pius did not take during his pontificate. The complete story will only be known when the Vatican archival records for 1939-1958 (Pius XII’s pontificate) are available to researchers. Until then, Ventresca offers us the best possible insight into Pope Pius XII’s life that we have in English today.